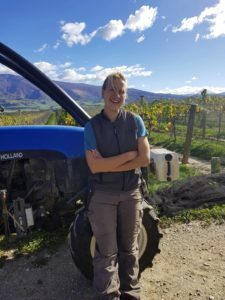 Olly Masters – Winemaker, Misha’s Vineyard. Despite a season that was off the chart in terms of heat we ended up with a vineyard that was possibly the healthiest it’s ever looked through to harvest. This was due both to the lower incidence of wind over the whole season and because harvest was much earlier/compressed so leaves were still in good condition. The rapid growth did make canopy management challenging and also meant canopy spraying was a constant pressure logistically as there was a high risk for powdery mildew with the speed of growth. The wind arrived just at the time we needed to put on bird nets which made the application quite challenging. The bird pressure was high this year possibly due to lack of alternate food sources and unseasonal snow which often sees them looking for easier food sources. 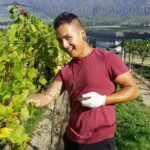 Top gun tractor driver – Aaron – pretty happy with the Pinot Noir! Overall the fruit has come in disease free and in good balance. From a winemaking point of view, acids have been lower than normal, but pH’s have also remained satisfactory which possibly reflects healthy canopy condition. Sugar levels were initially slightly lower than normal possibly due to due to occasionally the vines shutting down in more extreme temperature but then quickly increased as fruit softened. Seed ripeness was achieved early, and the overall crop level was not high, mostly due to lower than average bunch weights. The smaller bunches meant good fruit concentration across all varieties, particular highlights were the Gewürztraminer which was some of the nicest looking fruit we’ve ever seen on this variety. The Riesling was also very consistent in its fruit profile, and the Pinot Noir had good weight and fruit ripeness. In general ferments are proceeding well and finishing cleanly reflecting the healthy nature of the canopy at harvest. We will be pressing some Pinot tanks early to make sure we don’t over extract tannins. Malic acid levels are much lower than normal due to the very warm summer so malolactic ferment may go through earlier than normal, just like the rest of the season! Fast and furious is how I would describe the 2018 season! Talking with local veteran viticulturists and winemakers in the region, no one was sure what to expect! 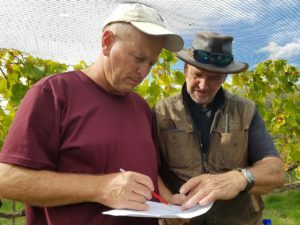 It’s still hard to believe we harvested all our fruit (with the exception of the late-harvest gewürztraminer) in just twelve days spanning a three-and-a-half-week period – and an entire month earlier than usual! However, the fruit was in sound condition and the juices/wines are looking great. This is a great outcome especially considering what it took to get there! • Soaring temperatures early season, often for several consecutive days, which made for an extremely condensed growing period. • Record low rainfall in the early part of the season. • Heavy rains early to mid-February which contributed to canopy vigour, as well as powdery mildew pressure and the risk of botrytis. • Wind which was atypically absent early in the season, finally coming on full force just at the time of net application. • A cold snap late January delivering snow down to 800m which drove wax-eye birds down from the mountains, increasing pressure to get nets on. • Weeds which responded vigorously to the weather, and the subsequent challenge to try and manage them and reduce competition. 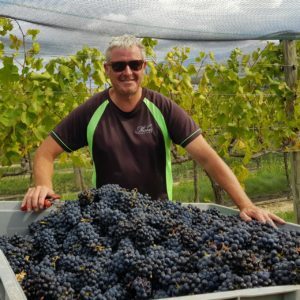 Finally, the ripening slowed in March due to cooler temperatures and we started harvest with pinot noir for our Rosé on the 11th March 2018. Overall bunch weights were lighter than historical averages, though not surprising considering the carbohydrate reserves stored last year would have been low from being such a cool year. Although some blocks had slightly lighter than desired crop loads, we had impressive uniformity in terms of berry size and cluster maturation – a notable contrast to last year. 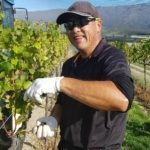 Despite the season’s challenges, our rigorous spray program kept the incidence of powdery mildew to a minimum and we saw virtually no botrytis infection. The canopy was quite healthy throughout the season including post-harvest- a rarity at Misha’s Vineyard. 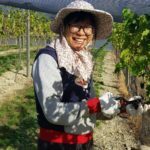 This is partly due to seasonal influences as well as the new leachate program that was implemented to promote soil and vine health. 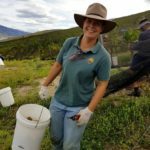 Sanna from Sweden – still working with us taking off the nets now! Whilst conditions this year resulted in a remarkably compressed season/harvest with high bird and disease pressure, we believe the sunshine, heat and nutrition program will certainly have had a very positive impact on next year’s crop in terms of yield, as well as overall vine health. I’m happy with this year and think we have a very exciting prospect for next year. * Note- GDDs reflected over shorter time period due to earlier harvest – and time of this report.